In the first of our ‘Invited Speaker Series’, Dr. Rohani Omar discussed what the study of dementia can tell us about the way in which musical knowledge is organised in the brain. Her research contributes to the ongoing debate about music and other domains (particularly language): do they share neural and cognitive resources, or is music a distinct cognitive knowledge domain? To illustrate the possibility of music being separated from language, Omar described the case of a non-musician with problems understanding word meanings. Whilst the individual was unable to name familiar tunes, she was still able to sing along with them, continuing spoken song lyrics when prompted. Omar’s latest research (Omar et al, 2010) compared musical knowledge retention in two expert musicians with progressive neurodegenerative disorders: BR, a trumpet player with semantic dementia, and WW, an oboist with Alzheimer’s disease. Semantic dementia (SD) is characterized by a loss of semantic knowledge systems associated with atrophy in the frontal and temporal lobes. BR exhibited typical impairments: recognising voices on the phone, anomia, surface dyslexia and prosopagnosia. He was still, however, able to play the trumpet to a high standard, as well as to read and learn music. Alzheimer’s disease (AD) is associated with atrophy in the cerebral cortex, particularly in the parietal and temporal lobes. WW displayed progressive episodic memory problems as well as difficulties reading and performing music. Omar described a series of experiments designed to test four different types of musical knowledge: knowledge of musical objects (compositions, composers and musical eras), musical emotions, musical sources (instrument identification) and musical symbols (musical notation). Experiments were tailored to suit the specific deficits for the subjects; for example, BR was tested on his retention of absolute pitch in order to avoid impairments in the verbal domain. A dissociation emerged, with the SD patient displaying greater retention of more abstract knowledge (musical objects and symbols), and impairments in identification from physical sources (instrumental sounds and musical emotions). The AD patient, however, showed broadly the opposite pattern. Omar highlighted how these deficits were distinct from the verbal domain, citing how the patient with SD was still able to play and read music despite problems with word comprehension. In addition, superordinate knowledge, such as knowledge of musical era, was better protected than subordinate knowledge, such as composer or instrument. Following the presentation, we first considered methodological issues. The experiments were particularly useful in that verbal responses (that would be affected by anomia) were not required, a problem that Baird and Samson (2009) found in their review of other studies of musical memory in AD. 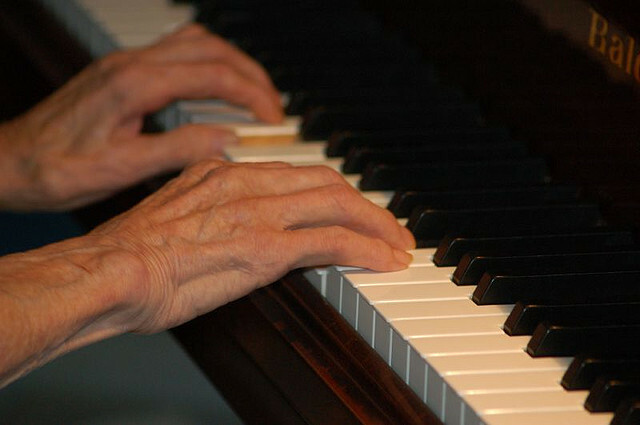 However, as with any unexpected preservation of a cognitive function in individuals with dementia, there is a risk that selection of musicians with dementia is biased towards those with the unusual skill preservation, as this may be the reason that they attracted the attention of the research in the first place. Perhaps there are more former musicians with dementia that have lost all musical knowledge in addition to other cognitive functions. It would be interesting to explore whether preservation of skills is widespread among musicians. Secondly, we considered how this research contributes to the debate of musical knowledge as a separate cognitive domain. Omar’s research suggests a degree of distinctiveness for the musical domain and Cuddy & Duffin (2005) found similar impairments to Omar and colleagues in an 84-year old woman with severe cognitive impairment (believed to be AD). Her memory for familiar melodies had been preserved, despite being unable to recall or understand the most basic of instructions. There is also evidence, however, that conflicts with (or at least complicates) the findings. For example Mènard & Belleville (2009) found that musical and verbal long/short-term memories are impaired in equal measure for AD sufferers. However, they did not test pre-existing memories and skills, but the ability of subjects to recall unfamiliar stimuli. There may be an important distinction between long-term, pre-existing musical memories tested within Omar’s research and the ability to form new musical memories tested by Mènard & Belleville. Further evidence arises from the debate about the neurological architecture supporting musical cognition. Peretz and colleagues at the University of Montreal have proposed music-specific pathways in the human brain (based on evidence from congenital amusics, where other abilities often remain intact despite severe musical impairment). Alternatively researchers have found significant overlaps between musical and linguistic pathways. Koelsch et al (2002) found that a neural pathway previously considered domain-specific for language (including the areas of Broca and Wernicke) was activated by ‘unexpected musical events’, while Palmer et al (2001) suggested that speech and music are remembered in similar ways. In contrast, there are interesting issues raised by musical savants and those suffering from Williams Syndrome, where musical cognition is often significantly enhanced compared to deficits in other domains (mathematical skills, for example). Another recent paper by Samson, Dellacherie and Platel (2009) found that musical information was better retained than verbal information in delayed memory tasks, even for those suffering from degenerative disease. More interestingly, retention extended beyond the musical stimulus itself, incorporating contextual information about the experimenters or the room. The finding that memory for music was retained despite verbal memory impairments suggests that this domain is more resistant to neural degeneration, adding credence to Omar’s suggestion that music could be considered a unique cognitive domain. Given both the overlaps and distinctions between music and language discussed, Omar’s research prophesises the potential value of future research, especially in the ways in which preserved skills can be targeted with therapeutic intervention. Music can be used as a prompt for memory recall in music therapy, but the mechanisms underlying this process are unclear. The findings of Samson et al (above) suggest the possibility of musical prompts being used to recall contextual factors (and possibly fragments of long-term memories). This harbours implications for music therapy and the potential enhancement of an individual’s sense of identity, regardless of whether or not it could help with everyday tasks (like the remembering of a shopping list). Could music be used in a therapeutic context to systematically access a whole range of long-term memories? If so, does this deny the very distinctness of the musical domain that many have sought to prove? Sacks, O. (2007). Musicophilia. Kent: Picador. See chapters 15 and 29 in particular. Photo by L-M-M, available under a Creative Commons Attribution-Noncommercial No Derivative Works license. I am a trainee in a Ph.D programme at Mahidol University. i do believe that we have it all< the quest is how are we going to put these av=dvanced knowledges into a piece< a complete picture that will save our lovely world. Last year i did a seminar on "Early Music therapy can help improved the MCA stroke." well, music is still a pesudoscience in many scientists' perspective. i interested in the amazing Automated Audio Recording (Lena foundation) that capable to diagnose if a child under age 4, within 24 hours, at home environment, may have potential in develping Autism. it is heart broken when you doing yoour research, with no advicer or around people who do not believe that Music Therapy, can help people more that this….nothing lost anyway right? it is sad when you have a proceedung but you have no one to give, to read, to advice. well, as a Thai person, i believed that "in the sea, we have fish, In the field < we have rice." We have it all, i do hope all the neuroscientists in the World be opened minded , for we are in the field that give us the opportunity to ASK QUESTION WE NEVER DARE TO ASK BEFORE, RIGHT? I'm not a grade A student, but i have all my heart with strong faith that we can make the societyy better with what we already have. so , i do appreciate your valuable kowledge. i'm so happy….at least i'm not alone.